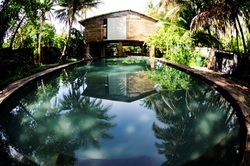 Guided surf trip packages and list of beach hotels, surf resorts and surfcamps. visit elsalvadorsurfcamps.com. The Puerto de La Libertad was founded in 1927 and it is the first port of El Salvador, back in the 50’s it was an international tourist destination; its major attractive was Punta Roca’s wave, back in the days was know as the Latin American J Bay, it was visited mostly by nomad surfers that adventure themselves looking for perfect waves here in the south..The port and its infrastructure was damaged back in the civil war last decade; and now, with the help of the government, the municipal table and different people interested in the tourist development of this part of La Libertad it forms part of an ambitious project which is now a few steps of being totally reconstruct. Surf Paradise La Libertad, you can find great deals and the best hotels with El Salvador Surf Travel website, different rates for backpackers, couples or groups, also surf services like surf schools and guide surf trips. visit El Salvador Surf Travel. 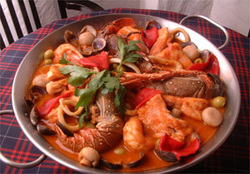 The gastronomy basis in seafood, variaty of restaurants menu full of srimps, lobster, fresh fish, shells, ostras. Add your resturant to our list, link to our page and be part of our travel network online.